Researchers have identified an impact crater bigger than the city of Paris underneath a kilometer's worth of ice — a little more than a half-mile deep — on the Hiawatha Glacier in northwest Greenland. According to a study published November 14 in Science Advances, the 31-kilometer(almost 20 mile)-wide impact crater was formed by an asteroid that struck Earth within the last 100,000 years and possibly even as recently as 13,000 years ago. Although its age cannot be conclusively determined at this time, the possibility that the crater is a recent formation has rekindled a debate about a critical climatic cooling event 12,800 years ago, when large mammals became extinct and ancient humans were populating the Americas. This cooling period, known as the Younger Dryas, occurred after the last Ice Age concluded and the Earth started to warm. The Northern Hemisphere suddenly became about 8 degrees Celsius (14.4 degrees Fahrenheit)cooler than it is today, retreating to temperatures common during the previous Ice Age. The cause of this cooling period, which lasted about 1,000 years, is not known. Climate scientists say that extreme events such as a volcano or a supernova could be responsible. A more recent explanation, and one that has sparked controversy, is a meteorite impact. The Science Advances authors have not yet confirmed that the impactor that caused the Greenland crater initiated the Younger Dryas, but several signs including its potentially young age might point toward that conclusion. Regardless of its age, the massive impact would have likely caused environmental consequences. "Earlier work on impacts generally indicates that an impact this size would have a significant effect on Earth's climate for some period of time," said Joseph A. MacGregor, a coauthor of the study from NASA Goddard Space Flight Center. If the ice was relatively thick during the time of impact, he said, it would have melted and vaporized billions of tons of ice. This meltwater would have disrupted the Atlantic Ocean's atmospheric circulation. The single or multiple asteroids also would have sent large amounts of debris into the sky after slamming into the Earth, blocking the sun and cooling the region. Kurt H. Kjær, lead author from the Natural History Museum and University of Copenhagen, identified variations in Hiawatha's ice depth and surface flow patterns as he analyzed a new map of Greenland's ice. This eventually led him and his team to suspect a hole underneath the glacier. In May 2016, Kjær and MacGregor's team completed three radar flights across the Greenland Ice Sheet and the next generation ice-penetrating radar found a large circular depression under nearly a kilometer of Hiawatha's ice. But radar images revealed much more than the outline of the depression, according to MacGregor. "I did not quite expect the detail and dramatic structures that we saw in that survey." The bedrock topography was extremely rough — a sign of a recent impact. Additionally, the radar data revealed the internal structure of the Hiawatha Glacier, which featured three ice layers, the researchers found. The younger layers covering the crater were "well behaved," according to the authors, but deeper and older ice was debris-rich and heavily disturbed. "An impact crater was the simplest explanation. Proof would take much more time, but that was certainly when I started to believe we were on to something," MacGregor said. Sampling rocks from a river that feeds out beneath the glacier's interior was always a part of the plan, as the authors knew they needed direct evidence for a massive impact. "That was fundamental to any good survey of a geologic structure, as you can learn many things that a geophysical survey cannot," MacGregor said. 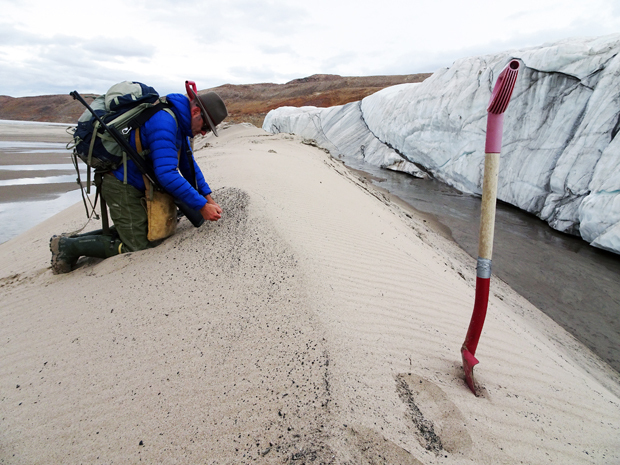 Kjær traveled to the Greenland Ice Sheet and retrieved three sediment samples deposited by the river draining out of the Hiawatha Glacier. In one sample, angular quartz grains with small fluid inclusions were present and showed signs of being shocked by an impact. Several of these grains consisted of carbonaceous materials and glass that are likely derived from impact melting of mineral grains in the bedrock. Kjær and his colleagues further tested subsamples of the river sediment and found that it contained elevated concentrations of nickel, cobalt, chromium and gold, indicative of a relatively rare iron meteorite. The distinct layers of ice from the radar images can be compared to the same layers in previously dated ice cores from other areas of Greenland. The ice surface along the border of Hiawatha Glacier corresponds to the top of a distinct, visually dark and debris-rich band previously identified in other ice cores as representing the Younger Dryas cold period, the authors say. Tentative age constraints on the crater suggest that it formed during the Pleistocene (2,588,000 to 11,700 years ago), though this age is preliminary and the site requires further, extensive study. "The ice layers integrate what happens to them over time," explained MacGregor. "It's hard to unravel what happened there and exactly when it happened." For now, further research is necessary. "More samples are needed, especially to date the impact, and more modeling is needed to determine whether our observations are compatible with an impact into thick ice," said MacGregor.